What is Smart Send Frequency? As your number of automations grow, the frequency at which your customers will receive emails will also increase– sometimes leading to customers getting overloaded with emails. To stop email overload, improve your engagement rate and get you more sales we've introduced a smart send frequency control. This handy tool will help you limit the amount of emails your subscribers can receive within a set time frame. You will find it in your Settings Dashboard, under the "Email Settings" tab. 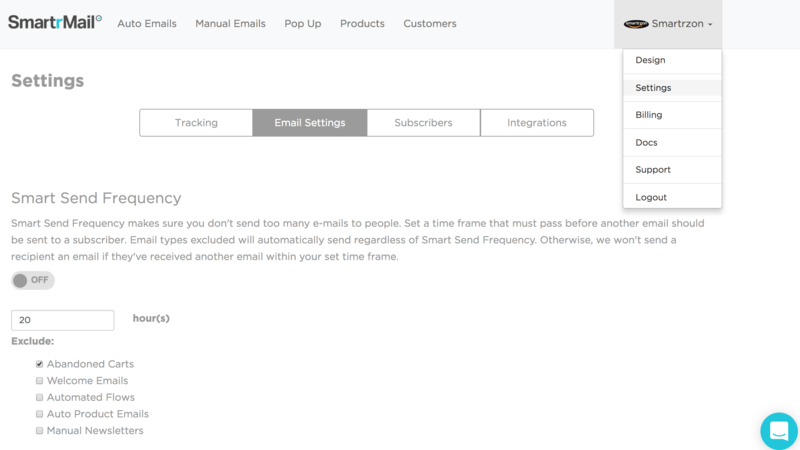 First, turn "On" the feature and select the time frame during which a subscriber shouldn't receive more than 1 email. Any kind of email will trigger the Smart send Frequency for your subscribers and will prevent other email to send to this subscriber. For example: Your subscriber receives your auto-product recommendation email, he will not be able to receive your manual email if this manual email is sent during the time frame your set. Then, simply choose which kind of email campaign you want to send no matter how many emails your subscriber received in the same timeframe. Select which types of email campaign you wish to exclude from the Smart send Frequency.